Note: Many more options are available by special order. If you don’t see what you want, ask! Once your product’s burned onto a disc, there are any number of ways you can box it up. We offer a variety of the most popular case styles. 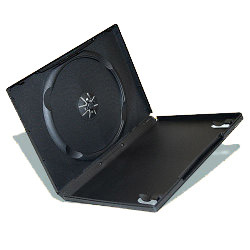 DVD Hard Case: Industry-standard protection for your video product, a durable plastic shell-case with lots of visual real estate outside and room for a booklet within. Styles: black. 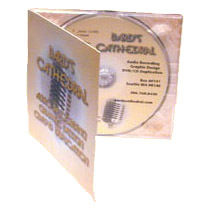 Jewel Case: The classic CD case, hard plastic with tray card and front insert. Also a choice for DVDs when size is a consideration. Styles: black tray, clear tray. Also available in two-disc style. Digi Case: You asked for it. By popular demand, we now offer this eco-aware case style as a short run product. Cardboard with a protective disc tray, four panels of printing. Styles: clear tray. Slimline Case: More compact than the standard case. 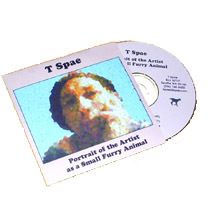 Space for an insert or pamphlet, or, if your disc imprint’s tidy, just a simple frame for the disc itself. Styles: black back, clear back. Card Case: A green-friendly cardboard cover like a small LP, plastic-free. Printable on front and back and can include a spine, overflap, insert or pamphlet. Styles: white or colored cardstock, black text or color printing. 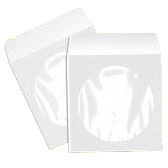 Paper Window Envelope: All the protection your disc needs and nothing it doesn’t. Spares the landfill unnecessary plastic. A good choice for informative or software CDs. Styles: white or black. 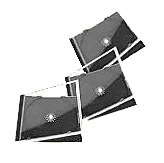 Disc Imprint: We offer two DVD or CD imprint types: black type and line images or grayscale/full color full coverage, both using 1500 dpi inkjet printing. We do not support white text on black for disc imprint. Inserts: Again, two choices: black text and line art on white or colored paper or cardstock or grayscale/full-color art on selected papers. Both choices use 600 dpi laser printing. 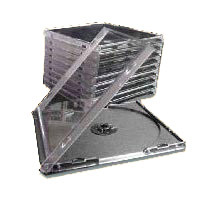 Inserts are charged by the panel: one panel equals one side of one page of an insert pamphlet or one side of a tray card or one side of a card case or case flap or one half of a DVD case insert. Projects may contain both b/w and grayscale/color panels. Assembly: Includes pro shrinkwrap — or not, if excess plastic offends you. We also offer shrinkwrapping as a separate service.